How's this for coincidence. 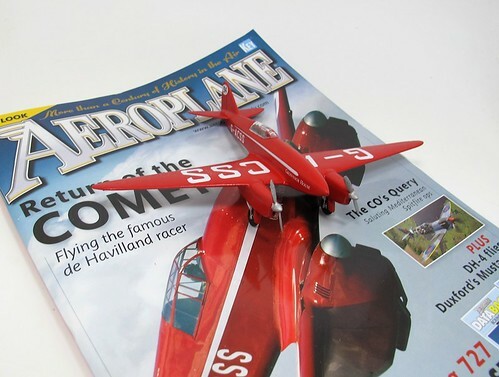 Just as I'm messing around with the Comet paintwork, in Smiffs is a magazine with the very aeroplane on the front cover. Of course I had to buy a copy - not something toy train buffs normally do (Buy a non-model railway magazine, are you mad? There is no world beyond the train set.) but I like to look beyond the hobby occasionally. Beside, my Dad likes to have a read and he's to stingy to buy a copy for himself. I was tempted to wrap it up fro Christmas. Finishing touches include some glazing bars drawn the on the canopy using a Bob Moore lining pen. They aren't perfect but then the clear plastic part is a bit wobbly itself. The horizontals are straight thanks to my trusty ruler, even if not in the perfect position. Verticals are short and done by eye as I couldn't be bothered to wait for the other lines to dry. Having said this, the pen worked perfectly, showing how good it is with gloss paint. Finally, the canopy was stuck in place with canopy glue and the model pronounced finished. Were the panel lines more pronounced, I'd liked to have had a go at a little weathering, although the prototype always looked pretty clean. Talking of the prototype, after success in the 1934 MacRobertson Air Race, the aeroplane enjoyed a slightly chequered career mostly involving the undercarriage several times. Fortunately, it can now be seen as part of the Shuttleworth Collection. One interesting story is that in 1938, the owner was contacted by a Jewish group with a well thought out plan to use the plane to bomb Hitler during a ceremonial parade in Berlin. A £1million price was agreed but then pilot Coulson decided against it for fear of what the British Secret service would have done once they worked out who had carried out the deed. One owners how history would have changed if he hadn't. I'm pleased to report that the transfers were quickly applied to the aircraft and sat on the gloss paint with hardly any trace of "silvering" caused by air being trapped under the sheet. In fact, the tiny amount that did didn't show itself until I started blasting the model with a hair drier while varnishing. The heat presumably expanded the miniscure spots of trapped air making them visible. One entertaining feature was the registration number. This is G-ACSS and so the transfers have it, except the one for the bottom, which if used as supplied, will produce G-CASS. A little scissor work sorted that out but you do wonder how it made it through proof reading. Transfers on, I sprayed the model with Satin Cote varnish to tone down the sheen. I don't like gloss models, they look too toy-like to my eye. All went well initially but then I spotted, horror of horrors, a run. I know from experience that dabbing a cloth in this to remove the excess varnish will ruin the finish. The cloth tears at the surface of the paint and the only solution is a strip and re-paint. With all the transfers, this wasn't an option and quite frankly, for the price of the kit, it would just be easier to chuck it away. Thinking back to a trick George Dent has suggested in his airbrushing book, I tried a waft more varnish hoping the thinner would mix with the run and spread it out. This didn't work but then it occurred to me to try wiping it with more thinner. Dipping the corner of my kitchen towel in the turps, I gently stoked the run several times and it gradually disappeared. Another quick waft of varnish and you can't see anything bad has happened at all. I'm doing this to learn more about painting, and that last trick is one that makes all the effort worthwhile. I can see myself saving a future project this way. My red enamel paint job looked very nice but close up, the finish wasn't perfect. Not to worry, my understanding is that those flawless finished on both model and real cars don't arrive straight from the spray gun - there is a load of hand finishing, or "buffing" to bring up the deep gloss. Anyway, I had a "4 Way Miracle Polisher" on my bench that I'd bought at the IPMS show out of curiosity. It's a foam block with 8000 and 12000 grit surfaces. Starting with the 8000, I polished the paint. It quickly became noticeably smoother to the touch but also dull. Assuming that the finer grit would restore lustre, I tried this but while the paint felt ever smoother, the shine was gone. Next, I tried a little Brasso wadding, this cleans up clear plastic so was worth a try. Result, plastic showing through paint. 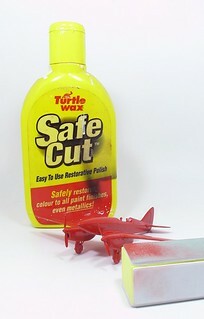 Finally, some Turtle Wax Safe Cut - their version of T-Cut paint restorer. I've used this on car paint with excellent results so felt it was worth a go on the model. Some shine returned but not much. In the polished areas, every raised panel line was back to primer so this obviously wasn't going to work. I suspect that I didn't allow enough time for the paint to harden. 24 hours is OK for acrylic and cellulose, but gloss enamel is a slow-drying substance and perhaps a couple of warm days drying time would produce better results. If yesterday's model was nearly described as a "Terrible train set", how about todays effort? Surely this thing has got to be beyond the pale? It's true, the "Rail King Intelligent Classical Train" doesn't have some pretty important limitations. Even it's greatest advocates will be hard put to pin down a prototype, no matter how much the box describes it as a "finely detailed realistic toy train". Let's be honest, it cost me £4.99 in one of Leamington Spa's less salubrious Christmas shops. I have a feeling that even this price might have dropped a bit by now. In the box is a loco, two bogie open wagons, a tanker and oval of plastic OO track with what looks like about code 200 rail. "So why did you buy it? ", I hear you cry. Simple, I'm always advising people to practise painting and weathering on old models or those acquired from the deepest recesses of the boxes found under second hand stalls. 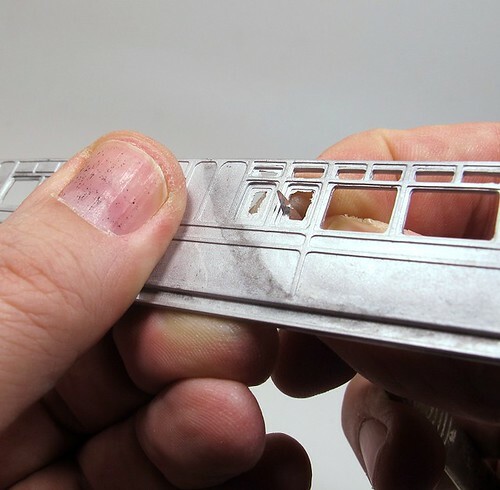 If you don't have access to one of these or simply can't bear to damage some 1970s Hornby Silver Seal collectibles, then here's the alternative. Ignore the loco and the wagons are pretty well detailed. Not authentic in any way but there's some lumps for detail and they are vaguely train like. At this price, there's loads of scope to b****r the whole lot up and yet not to care. After all, when the paint and powder costs more than the base model, it's hard to worry too much. I was tempted to entitle this post "Terrible Train Sets Part 1" but on balance, this seemed very unfair. Maybe Top Gear can get away with reviews that always conclude the opposite way they appear to be heading initially but this is an erudite blog read by well brought up and intelligent people so I'll not bother trying to fool you that way, you're all far too smart to fall for it. What you see above, is an Atlas Editions 1/220 scale model of Flying Scotsman. The one that is advertised on leaflets that fall out of your favourite model railway periodical and costs (according to the invoice that I am instructed in large letters to keep for my records) a whole £1.99. I'm not really qualified to provide a full review of this model (if you fancy it, please comment away, I'm very interested and so would other readers be). To me it looks like a steam train. 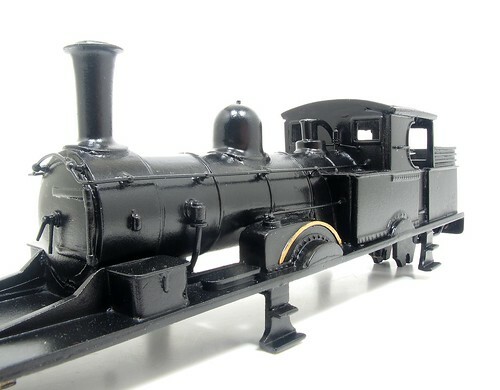 Perhaps the detail isn't very refined but then the loco and tender are 11cm long so it is tiny. A 1970s Hornby model in OO wasn't that much better in places! The Valve gear and cylinders look a bit hopeless but then full Walschaerts in this scale would be a watchmakers job. The coaches have something very odd going on with the toplights but the main windows are see-trough and glazed. A little black paint might help along with some flush glazing. All the wheels rotate, including the loco wheels with con rods attached, but the bogies don't swivel so I'm not sure what the point is. Obviously the thing isn't motorised. If it was, for that money they would be selling faster than warmed up cake. I bought this for two reasons: Cheapness and Curiosity. The set comes nicely packaged in a card box about the size of a CD and not much thicker. The mock velvet inside gives an air of quality. There's some information, a replica poster and the invoice that must be kept. This is part of a series. When I rang up to buy, the salesperson tried to persuade me that I wanted an A4 as well for a bargain price of £7.99 the two. I declined. I'm not that curious. To be fair, other than sending me regular e-mails offering other products from the range. Atlas haven't hassled me at all, just as promised on the paperwork. Presumably this is a loss-leader and they make their money when you start buying the more expensive follow-up items. Maybe I wasn't convinced by this one, but the trams and diecast vehicles look interesting. Anyway, what to do with this? I have a feeling that there is potential for a rather nice nighttime diorama here. Darkness and nifty modelling would hide the worst bits of the model and the resulting piece would be less than a foot long. "I saw this and thought of you. ", so said my writing friend Candice as she handed over the festive parcel to me. I opened it up and you know, she was right. 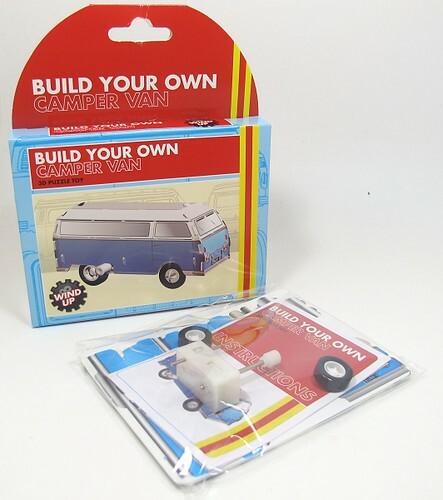 A kit to build a VW campervan. This couldn't be more me if there was a picture of my mugshot on the box. 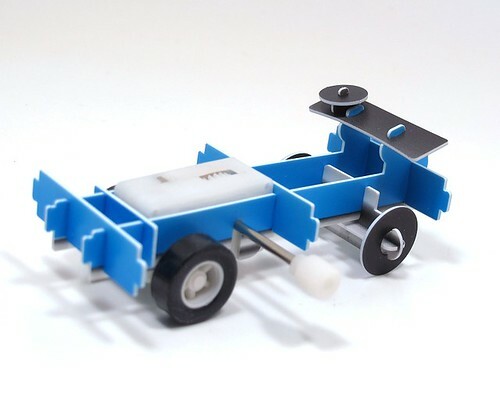 Inside the kit, or 3D Puzzle Toy as the box refers to it, is made up of parts you press out of small sheets of thin plasticised foamboard. I'm not exactly sure what it is but thin and strong pretty much describes it. 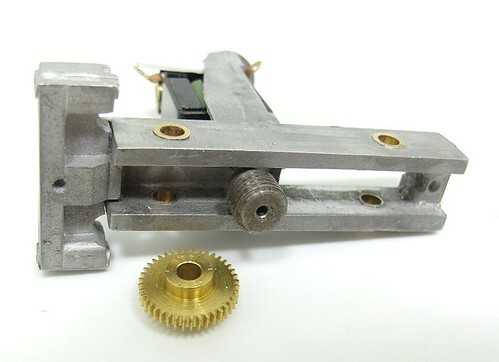 Assembly starts with the chassis containing the clockwork motor to power the model. Everything slots together simply enough by following the instruction diagrams. You'll notice the front wheels are thin foam while the back are plastic. In this respect it's just like a drag racer. The body folds over the chassis. Locating it on the tabs sticking out the side is a little fiddly but thanks to the strength of the material, not too bad if you have reasonably nimble fingers. "Does it work? ", I hear you cry. Merry Christmas and a Happy New Year to all the readers of Phil's Workbench. OK, so the acrylic paint isn't working for me. Not wanting to be defeated by a plastic pot of pigment, it's time to stop messing around and use proper style paint - enamel. First step, strip off the blobby mess. A wash with Precision Paints Superstrip sorted this out. The acrylic hadn't stuck to the primer at all and came off in sheets. The stripper works well and after straining, has been returned to the bottle for use again. After a wash down and an overnight dry, the gloss red was sprayed on. 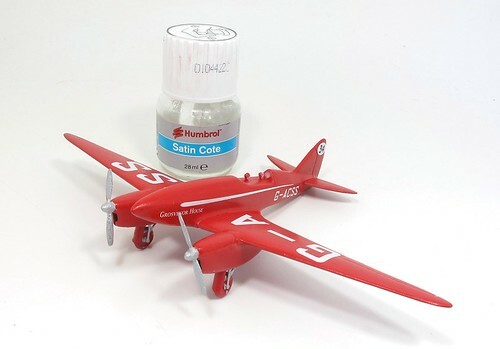 Thinned with white spirit, it worked as well as enamel does, the result being a nice shiny aircraft. OK, it took many hours to dry and needed to be covered up while doing this to dodge dust but at least it covered easily. Life would have been even easier if the airbrush hadn't still been suffering the effects of the old paint. How the stuff can be so useless but dry to the consistency of steel inside the tiny bits of spraygun I don't know. 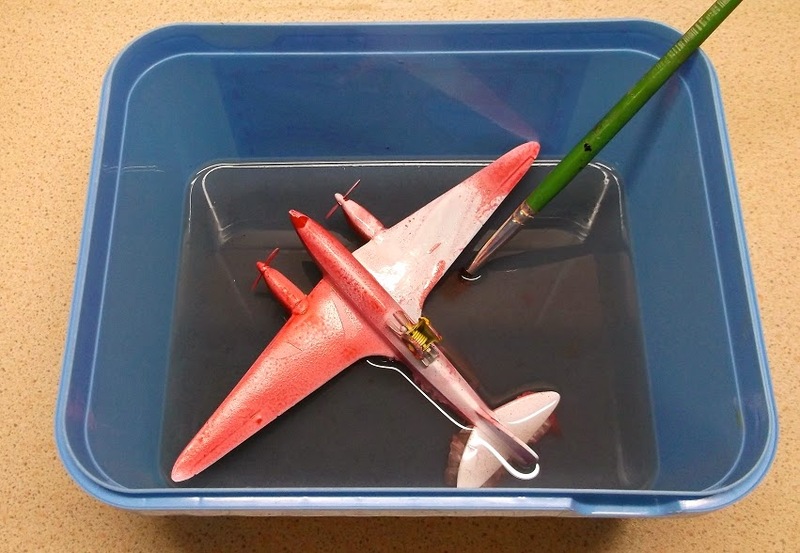 Anyway, now I have a gloss red 'plane. It's not perfectly smooth, but after Christmas, when the paint is properly hard, I'll try out that new buffer block I bought for this sort of job. While the kit hasn't gone together perfectly, I'm not too fussed about this. After all, it cost very little and is primarily a painting challenge for me. I've no idea what to do with the finished model, if it gets that far, but for the moment I press on. First up, a coat of white primer sprayed on and left to dry. This shows up a few niggles but the model actually looks better than I thought it might. The paint handle - a clip gripping the pilots necks - seems to work well as long as I hold it with a gloved hand. 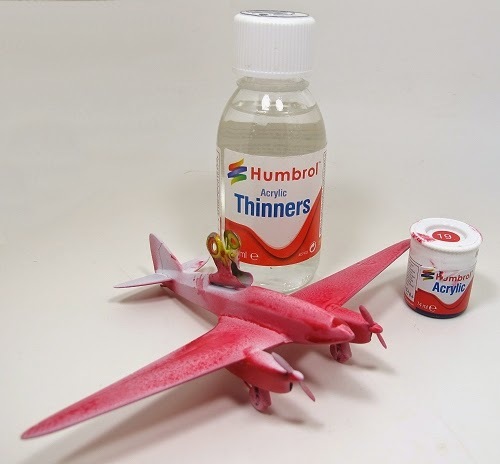 My plan is to spray the 'plane with red Humbrol acrylic. I've recently completed a magazine project using the companies rail colours and was very pleased with the results and ease of use. They dried incredibly matt but with a nice finish. Having never used gloss acrylic before, I reckon it's worth a punt. At the very least, the fast drying times should reduce the amount of muck that will find its way in to the surface. My first attempt with acrylic saw me thin the paint with normal water. There it worked fine but with gloss - hopeless. Either the paint won't sit on the surface or the stuff is too thick to come out of the airbrush for more than few seconds. Building up any sort of depth of colour isn't going to happen so it's time for a re-think. Luckily, I have the proper thinners so I clean everything up and try again. The results are a tiny amount better but still absolutely rubbish. The paint bobbles on the surface or runs around like water. When I stop, it sets in the airbrush meaning I spend as long cleaning the thing out as I do spraying. By the time I give up, my spraybooth looks like an abattoir. The airbrush is solid with paint (all the bits now resting in a bath of cellulose thinners) and the model looks hopeless. Where the red has a bit of depth, it's IS shiny but I'm pretty certain no matter how much paint I put on, it isn't going to get any better. I'm sure this is a lack of skill on my part, but I wonder how I can spray matt colours perfectly and gloss so badly. More pressingly, I now have to work out how to get the paint off the model and have another go with some proper enamel paint. Or just chuck it in the bin and do something else. 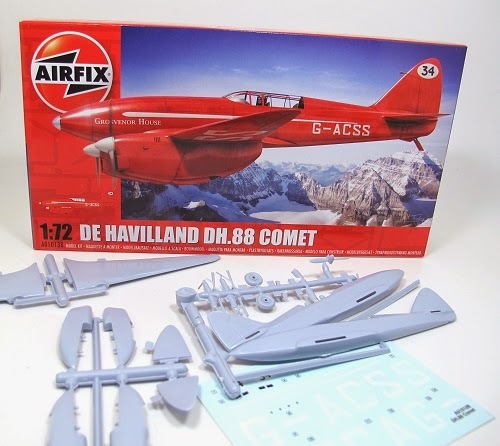 So, I'm browsing the Airfix "Black Friday" sale and spot this rather nice looking aircraft for under 3 quid in the selection. Well, I'm buying one or two other bits so I add it to the basket. While I have a million other "proper" projects to finish, I fancy this as a bit of a quickie and a useful test. You see, this 'plane needs to be painted properly. Gloss red. With perfectly applied transfers. I'm not sure if I can do this but I would like to try. Anyway, it's a break from the soldering. First up, stick the kit together. If I'm honest, I though this would be a quick job. I hadn't counted on an old kit with terrible part fit and hardly any locating tabs. Nothing between the two halves of the fuselage anyway. Lashings of liquid plastic glue later (apply, push the joint hard together so a little plastic oozes out) and I've done it. The wing tabs had to be trimmed to move the leading edge somewhere near where it should be. One tail fin was a lot higher than the other but making the locating slot deeper sorted this with filler covering up the badness. Air intakes on the front of the engine nacelles are little more than ragged holes but I tidy these up a bit and will live with them. Annoyingly (to me) you can only build the model with the landing gear down. I quite fancied an in-flight version like the box top shows but then I suppose there isn't a stand supplied so that wouldn't work either. 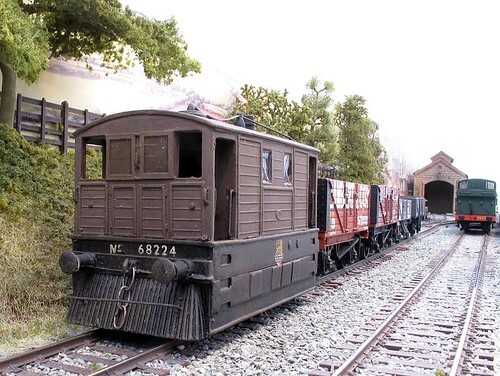 This week saw Hornby announce their 2015 range of models. 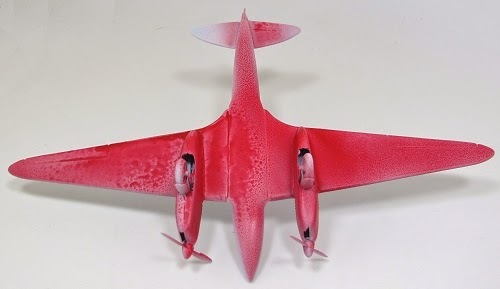 As usual it's been a cause of much frothing on-line with modellers busy reviewing each and every model, even if they haven't progressed much beyond a set of CAD drawings. The men from Margate aren't alone - all the manufacturers like to warn us about future products so we can start saving our pennies. The announcements are also reviewed by the hordes every time a prototype or early test shot appears. Over at Albion Yard, Paul has commented on some issues with DJModels 02 test shots (Calmly and sensibly, there's plenty of loony tunes out there but I'm not linking to that. Besides, he's bought me beer in the past). Even I've spotted problems with the same firms J94 and it's injector attached to a fictitious paving slab. Now, the idea behind a lot of the more measured criticism is that the manufacturers will take notice and refine the finished product. Personally, I rather they didn't because a lot of these are easy fixes for modellers. As an example, look at the Hornby J50 prototype above. It will have nice wire handrails and a separately fitted smokebox dart. I think this is a great pity. For my money, how about a body that is scale, a good quality chassis and then some moulded on bits. This way the cost will be kept down (not enough for the Internet loonies but still down a bit), the loco would fit in the "Railroad" range and even some train sets. Oh there would be cries of anguish. Everyone knows it a HUMAN RIGHT to have separately fitted handrails on a toy train after all. But - if you want to upgrade, you could. Nothing very difficult here and at the end of the day, your model would look better than one untouched. I'll suggest (and yes, I am being deliberately controversial) that high quality RTR is robbing modellers of the chance to do some modelling. The top end stuff is so good that only the best modellers can hope to match it. So, people don't fiddle with it and since there is no easy way to get started with modifying a model they don't take that first step. We've even reached the stage where people are paying to have real coal added to the bunkers or tenders. The simplest improvement you can possibly make to a model steam engine and yet it's a service bought in "In case I make a mess of it. It's just easier this way." Still, the genie is out of the bottle. It's too late to go back and I guess we'll have to work out other ways to persuade people to get modelling. In the meantime, I don't need a J50 and if I did, there is a 3mm scale one on the shelf. And I'll always think it is better than the Hornby one 'cos I made it myself. I'll admit I'm a bit of a sucker for RNLI stuff. When it comes to supporting a charity, one that involves volunteers heading out on dangerous seas in all weather to try and save lives gets my vote every time. That and I like orange things, especially orange boats. All this means that if I find an RNLI shop, I'm going to be spending money and probably buying all sorts of stuff that I don't really have a need for. Which is how I ended up with a clockwork lifeboat. It's a funny looking thing. 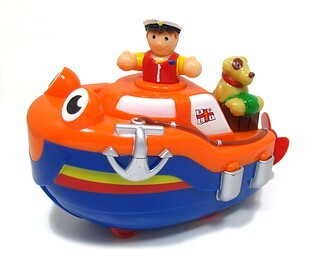 You rotate the little man to wind up the motor and he spins gently as the model sails along. If water is not available, the toy has wheels so can be run around the floor like a car. 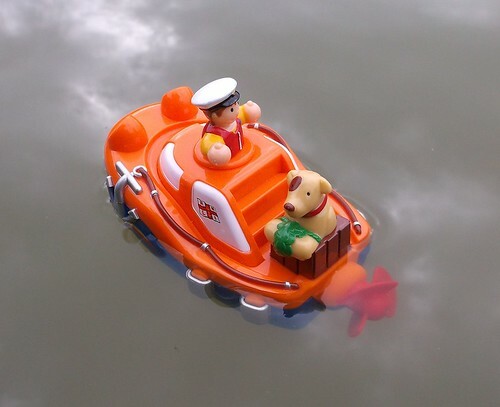 I know my lifeboats well enough to know that the RNLI don't have any amphibious vehicles, but perhaps they should consider one based on this. Of course I can't just sail my boat in the bath. It needs a try out on the model boat club lake. Despite sitting very low in the water, the model performs but the clockwork motor isn't really man enough for these conditions. The run time is pretty hopeless too - although to be fair I don't think the designers we thinking of me when they were chewing the ends of their pencils. I did ponder fitting a motor, possibly a servo converted to drive the model, but that looks like a lot of work. For a start, how would I get at the insides? Back to the bathtub with this one I think. A couple of hours work with the soldering iron and here we go. Not a bad looking railcar body, but a pretty heavy one! First, the sides and floor were made up using a ruler to ensure everything is in a straight line. This left tiny gaps around the centre doors. I'll live with these as a humped body is more of a problem. Running low-melt in from the back pretty much eradicates them anyway. The floor slots in place and with a couple of partitions in place, all seemed to be going well so I added the second side followed by the rest of the partitions. 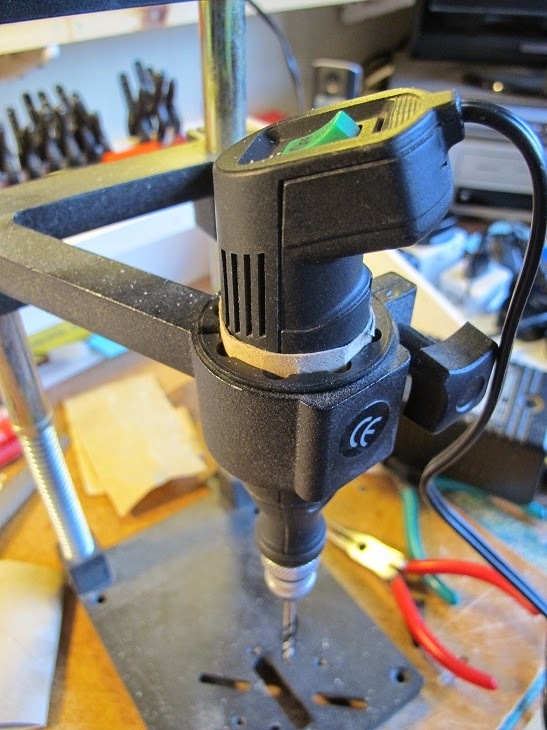 The great thing about low-melt soldering is that you can tack bits together very quickly and undo the join if it need adjustment. The ends take a little care as they aren't identical. The panelling under the windows is deeper at one end than the other. These castings took a little massaging with fingers to straighten them up but after this, the champhered corners fitted pretty well although I did need to cut away a little bit of casting below the floor. Once happy, all the joins were seam soldered. It's still very flexible at this point, etched sides would be better in this respect, but I can certainly see how the model is going to come together. 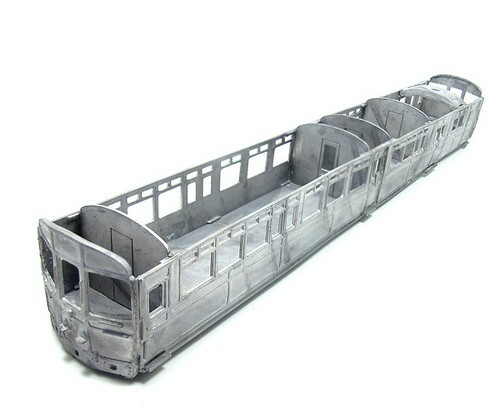 Presumably due to the limitations of the moulding machines used by Nu Cast, the railcar body is supplied in twice and many bits are you might hope. Each side, roof and floor is a pair of parts to be joined by the builder. First though, there is some light flash to clean from within the windows. When mentioning cleaning up, most people think of files but I prefer a sharp knife for this job. OK, carving metal seems a bit off but lead alloy is soft and Swann Morton blades aren't, so it cuts like butter. More to the point, the flash is incredibly thin so carving it away is a quick and easy job. For a really nice finish, the same blade can then be scarped along the edge to finesse and polish any hint of mould lines away. John asks: Have you ever thought of making a GWR railmotor? This is something that I I always wanted. I'm not looking for a lot of detail just an overall look and was wondering whether something could be made with the Hornby auto coach. This isn't the first time I've been asked about railcars recently. To start with John's question. Possibly BUT the body isn't the difficult part of such a conversion. Finding a suitable chassis with all the waggly valve gear bits is pretty much impossible. Maybe there is something from a continental range that could form a basis but it's going to be a lot of work. 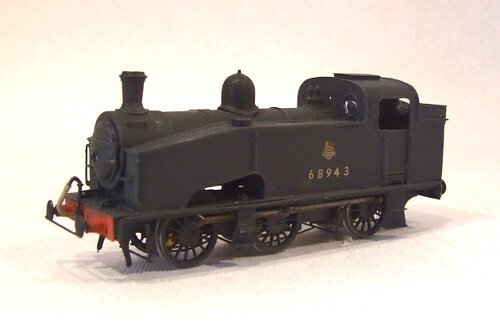 Far better, if I'm honest, to await the RTR version from Kernow Model Centre. For £150 and a bit of a wait, I don't think you'll beat it. However, this isn't a blog where I sit and wait for someone in China to be told by the bloke who used to run Banbury model railway exhibition what to do. No, I still have a Nu Cast whitemetal kit to build. When I left the model, I'd put the powered end chassis together and was about to fit the mechanical bits. Easy, or so you might think. Well, persuading the motor to fit in the casting that appeared to be the mount took me over an hour. Lots of filing and scraping at the whitemetal to make the distance between the sides wide enough to slip the DS10 in place. Eventually, there was success. With a couple of plasticard wedges, the motor turned under power and didn't rattle the sides. Then I had a look at the gears. And there was a problem. Oh, yes, a good 'un. The worm gears is too fat for the chassis and even if I fix that, it's nowhere near the gear on the axle. Re-reading the instructions, I spot a tiny note on the drawing showing the motor doesn't fit where I thought. It should be on the back of the casting. Arghhhh! However, this isn't the solution you might hope for there are some issues. First, it appears to be held in place with willpower and possibly fairy dust. 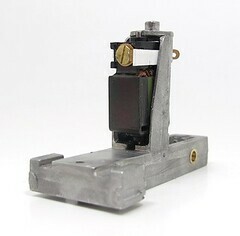 Certainly no screw attachment points or castings are shown to do the job and nor are they evident on the model. Second, the gears are still in different time zones and the worm isn't going to fit any better between the frames. I'm sure there is a fix for this, probably a different motor/gearbox combo (no I won't use a SPUD at the other end, I want the waggly bits powered) but I need to know how much space is available. Therefore the next job is to build the body and see how all this lot hangs in there. 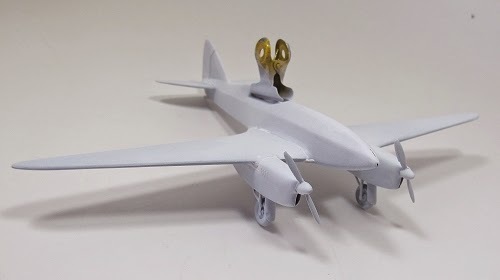 One of the great myths that I spend time trying to persuade newer modellers to stop believing in is that those of us who have been at it a while approach a task and simply get it right. It's not true. The main difference is that we know we're going to mess up so don't launch in to the final project without a little bit of preparation. A little test piece can be a great way to try out a new material or technique. If it goes wrong, the piece heads to the bin and we try again. 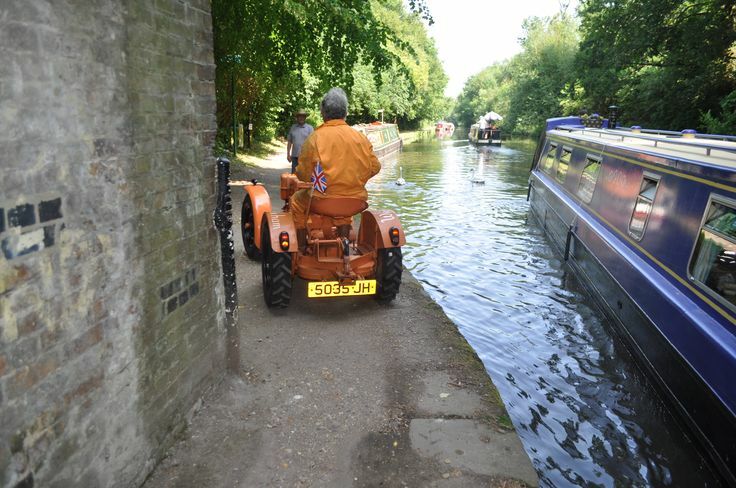 Works number 8398 covering a prototype "Barge Towing Tractor" which was a narrow rubber tyred road vehicle designed especially for running on the towpath towing barges along the River Lea Navigation. Considered a success, around 14 more were ordered and they are said to have been a direct replacement for horses and were supplied around 1960. "I wonder what one of those looks like? ", I ponder. 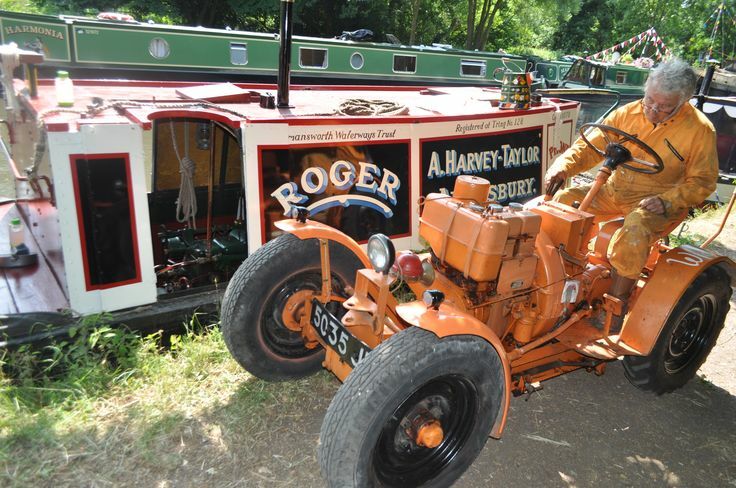 A quick search on t'internet later and I've found photos of one owned by the London Canal Museum. Sadly, not currently on display, it looks brilliant and not just 'cos it's bright orange. Building a model would be a bit of a challenge, although a bit of fudging might produce an acceptable version to tuck in the corner of a model railway. The full set of photos can be found on Pinintrest here. Recently, I was loitering around the excellent L&WMRS layout "Clarendon" with my compact camera and snapped a couple of views that appealed to me. By no means professional quality, I thought they might look better converted roughly to sepia tone - appropriate for the period modelled. You'll notice a lack of locos but then I've always been more interested in the scenery and buildings. I don't know how this happens, but the pillar drill stand we have for a Minicraft drill seems to be slightly too big for the power drill we have. Needing to pop a (sort of) perfectly vertical hole in some wood for a rudder, I quickly sorted this out with the inner tube from a toilet roll. Slit down the side and slid in the drill stand, it gripped the drill perfectly and we made quick work of the hole making. Someone with an engineering bent will tell me this is A Bad Thing but as the cardboard is rough, there seems enough friction to grip the thing. 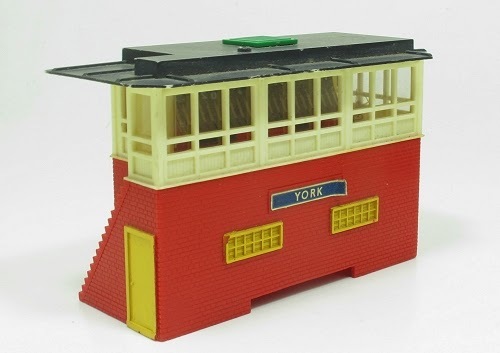 Some of you will recognise this - it's a Triang R145 Modern Signal box. Question: Is it based on a prototype? 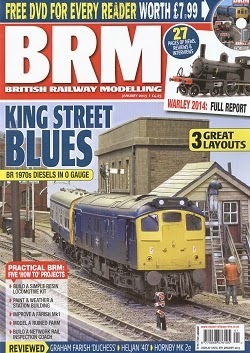 January's issue of British Railway Modelling sees me messing with several lumps of polyester resin both on the page in also the DVD. DVD first, I've been modifying 7mm scale Skytrex GWR hut to add some extra windows. This is one of the great things about resin models, the material is soft enough for each chopping and changing. In this case I've added some extra windows from a Peco spares pack. Whilst from a smaller scale than the main building, they actually look very close to the windows already moulded into the walls. You've actually seen the model on this blog already - for the camera I didn't need to finish the model. This took place later away from the studio. 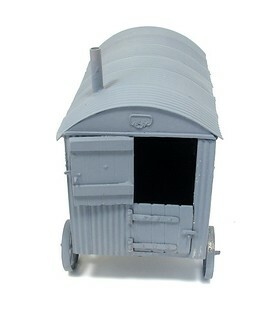 Now the hut has made its way to the NRM, hopefully to find a home in the corner of the model railway in the great hall. 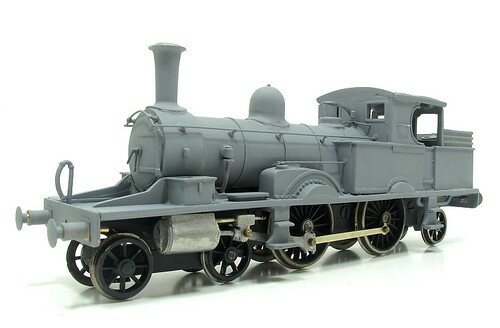 On paper I'm building a resin loco kit - the J70 from the Silver Fox range. Quite how this popular prototype has escaped the attentions of the Ready to Run manufacturers amazes me, but for now, if you want a good one, you have to build a kit. As far as building goes, there isn't a huge amount of work. The main body is a single part casting and the chassis is a Black Beetle ready to use unit. A little detailing and fettling rewards the builder with a rather nice loco. Best of all, it's a simple induction in to the loco builders club. 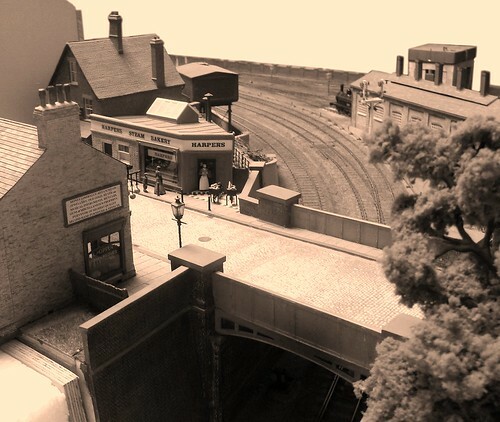 Finally, we have part 3 of the Owen's Bridge layout building. I'm putting together the farm using Airfix ruined buildings cast in resin and providing the troops with transport by building a W^D Models resin lorry kit. Resin - Good stuff, isn't it. There we have it. Some transfers, a bit of red paint (Humbrol acrylic as I had a pot handy for another job) and a spray of Satincote varnish. 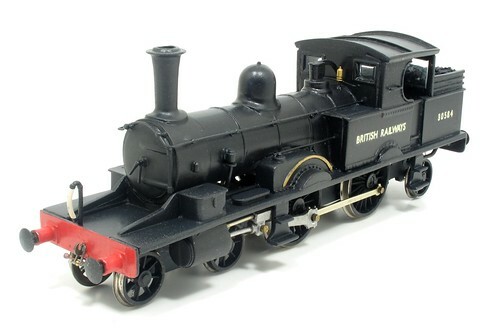 Finish up with a matt black smokebox and some screw couplings that are probably contemporary to the kit. OK, it's not the most hi-fi of models but the prototype's elegant design shines through and I think the ancient K's kit captures it very nicely. This is such a pretty loco that for the moment I can't bear to weather the model so it sits in the cabinet looking pretty. The loco is going to be black. Do I break out the airbrush for a fine finish to the paintwork? Nope. Halfords satin black aerosol. Warm it up in some water, give it a good shake and spray. Result - pretty good. No clean up either. Can't think why I'd do anything else. The brass strip by thee way is Mr Hobby metallic paint. I'm not the only one who thinks like this - Muz duz too. I don't understand why, but one of the K's Adams Radial splashers is too small. Quite a bit too small. Small enough to leave a great big gap around it's top edge when fitted in to the side that has a gap for it. My suspicion is that the wrong part was in the kit and the previous builder just fitted it and bodged with filler. That doesn't work as the riveted strip looks odd, it should be along a nice clean right angle. Never mind. First I pushed low melt solder into the gap from inside the loco. You can use this stuff as both joiner and filler. Then a bit of microstrip over the top of the splasher bulked it up enough. Files back to provide a flat face and all is now good. One of the benefits of belonging to a model railway club is that the library contains books you'd probably never buy yourself. One such is "Ideenreiche Modellbahn-Anlagen" by Ivo Cordes. 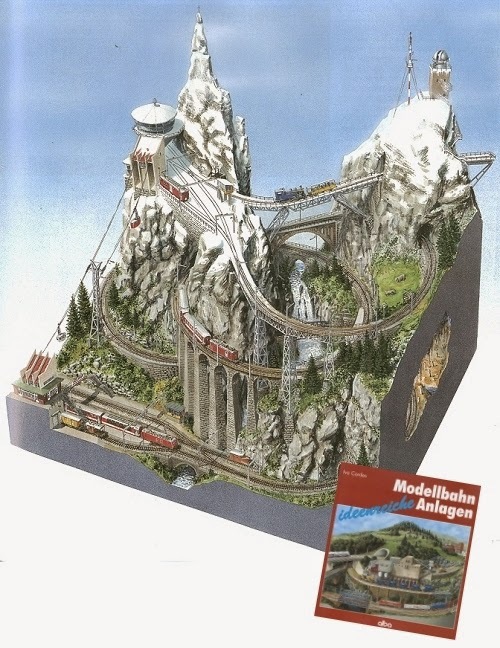 Basically, this is a German plans book for model railways. As well as a trackplan, most layouts are illustrated with a drawing showing the finished model. Most of these are superb and simply flicking through the pages is a joy - good thing really as I don't read German. My favourite is this winter scene. You just don't see this sort of thing in British plan books - it's completely mad. Rack railways, viaducts and a cable car in space 1.5m by 1.15. I wonder if anyone has built this for real? 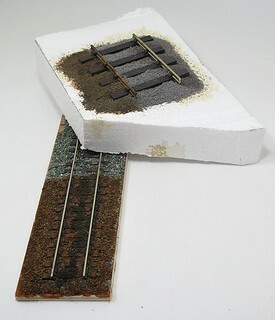 John asks: I occasionally see mention of railway modellers using foam over their base boards before laying track on top. To me foam is soft and bendy and stuffed into cushions and not very hard wearing so I guess this must be some other form of it. Can you enlarge please on exactly what it is and how to use it. Can you hide wires underneath or through it to avoid having to pin them under the base board ? I suspect the foam you are referring too is track underlay. 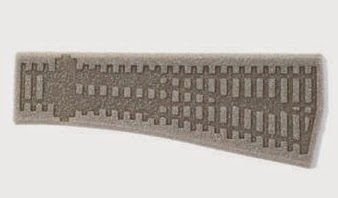 This is a foam strip, usually moulded with an impression of track in the top surface. Track is laid on to this and then pinned through to the baseboard and gives a representation of ballast as well as providing some cushioning. The foam is medium density so reasonably stiff but will compress if you push it or nail the track down too heavily. If pinned lightly, the foam will reduce the sound given off by trains but if I'm honest, with modern RTR, it's hardly an issue. The idea you need to reduce the noise is a hangover from a few decades ago when gears ground away until locos were run in. Underlay has fallen out of favour over the years. I can't recall anyone who has used it and I know I haven't. Granite ballast is cheap and more realistic, but applying it can be messy and if you get it wrong, gumming up an expensive point isn't difficult. Underlay solves this. If realism is key, it's perfectly possible to use underlay and then cover it with fine ballast. Although I've not done it, I have seen photos and the results can be really effective. I'm not sure it helps much with wiring although you could easily run fine wires underneath it and let the foam adjust itself around them. What is a bow pen? John asks: Reading with great interest your article on painting the Speedline Pilot Boat. Sounds very much like me to a tee! The part that intrigued me was your reference to using a "bow pen" to outline the silver wheelhouse window-frames. I have not heard of this before, could you enlighten me? 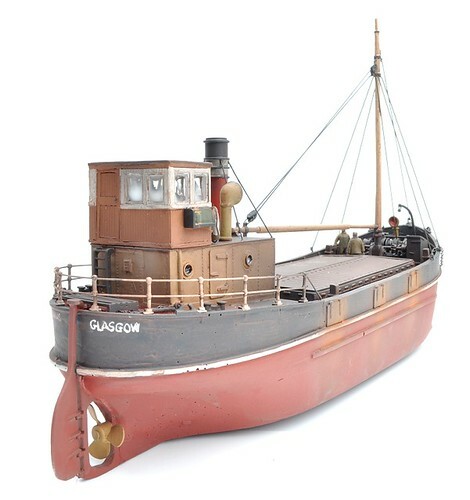 I am restoring an elderly Caldercraft model of the Clyde Pilot Boat, and feel the pen would be a boon for high-lighting the port-holes in brass. Bow pens aren't the common instrument they were in those black & white days. Then, every draughtsman would wield one with aplomb and all schoolchildren found one in their geometry sets. Now it's all Computer Aided Design and kids don't know they're born and wagons wheels have got smaller etc. 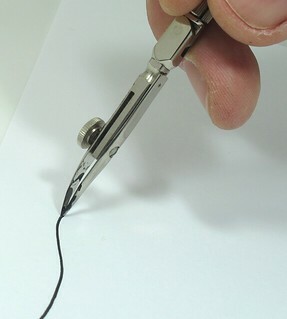 A bow, or ruling, pen is an instrument for drawing lines with ink or in the case of modelmaking, paint. The pair of steel jaws are set a tiny distance apart using the knurled nut on top. The wider they are apart, the wider the line you draw. Skilled users can produce neat lines a fraction of a millimetre wide. To use the tool, place a drop of paint between the jaws using the end of a tiny screwdriver. You don't want paint anywhere but in between then so wipe off excess with the paper towel. Next, try drawing a line on some paper or (in my case) the edge of your modelling board. If it's right, proceed to the model if you are feeling confident. If not, adjust the width and try again. Neat enamel works well as does Humbrol acrylic. You don't want to thin the paint if possible as it tends to come out on a blobby rush. Cleaning the pen depends on the design. The one shown, which I inherited from a proper old-school draughtsman allows me to swing the bottom jaw out of the way without adjusting the gap. My old school set doesn't have this so you dunk it in thinners and then fiddle around wiping the ink/paint out. Whilst very useful, this is a tool that demands practise to get the best from it. I'm not very good but was able to run a line around the edges of the windows of the boat mentioned so I could them paint up to them with a brush. It's quite useful for locomotive "wasp stripes" too. With practise and luck, a straight line is reasonably easy to draw for neat edges. A quick search will normally throw up bow pen suppliers - Golden Arrow do some useful looking sets. You are often advised to buy the best you can afford but for the beginner, a stationery set version will allow you to play and decide if it's worth upgrading. 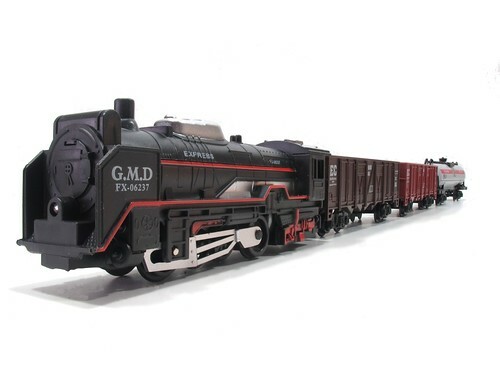 Try eBay too as there's always some in the Finescale Model railways section and this is a tool it can be worth buying second hand as you might get a top-notch model on the cheap. How green is my hut on wheels? 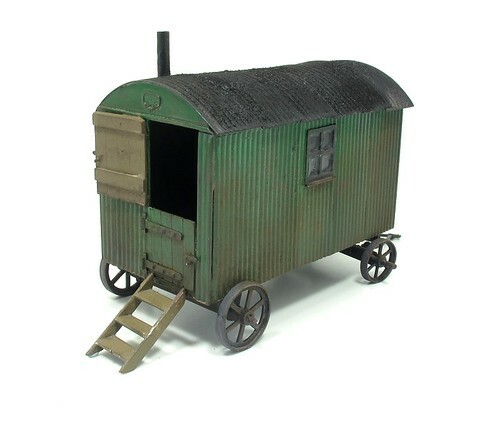 As far as final colours for the Duncan Models shepherds hut, the box shows a green body, black roof and undercarriage, which all seems pretty reasonable. It also shows a white window, which is considerably less likely since white gloss paint is a relatively recent innovation. In my mind there is a municipal green that the your towns Corporation painted everything in between about 1920 and 1970. Lawnmowers, railings, lamp posts, road rollers, and engineering equipment etc. it was all painted green. I'm sure there is a proper paint code but Railmatch 307 Early Multiple Unit Green looks pretty close and more importantly, I had a spare bottle slowly going off on the shelf. The body was brush painted. 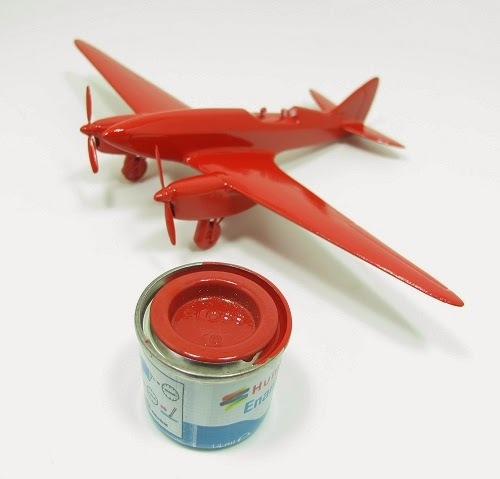 Railmatch paints are much better sprayed than brushed in my opinion as there isn't enough pigment in them to cover in a single hit so you need to build up thin layers - ideal for spray and I've had really excellent results when applied from the airbrush. Here though, the brushing left the primer showing through slightly, which is exactly the look I was after. This isn't a new hut after all. It's been painted with whatever came to hand, in this case a couple of pots "acquired" from the local council. 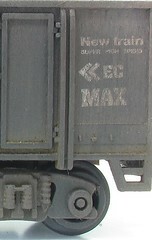 The same companies (Railmatch, not the council) weathered black did for the underpinnings. This does have loads of pigment so brushes very nicely. On the roof I wanted it to look like a pitch had been applied so I painted a thick coat of Humbrol matt black and then dusted some talcum powder in it. The talc soaked in so I gave it more until the paint was all absorbed and finished off with black weathering powder. It's odd, but when you want something to look like it's been painted with a tar brush, this proves harder than when you don't. After all was dry, a wash of thinned track colour, a little dry-brushing with rush and metalcote steel followed by a dusting of mucky brown weathering powders and we are ready to go. Duncan's hut on wheels is lovely but while the box picture shows a chimney, I couldn't find one inside. No matter, a brass tube off cut soldered to the roof and then fiddled to be upright soon sorted this out. It's probably better than a whitemetal one anyway as you can see it's hollow. Looking from a normal elevated viewpoint, the lack of a floor inside is a big problem. While I appreciate that these things weren't kept in the best condition, you shouldn't be able to see the ground! Sliding some pre-cut Daler board in was fiddly and if you look closely the sheets overlap in the middle, but at least looking in through the top of the door shows darkness now. Inside, I'm just painting it black. An interior would be lovely but you won't see it on the layout so I'll skip the scratchbuilding. A little queue jumping now. 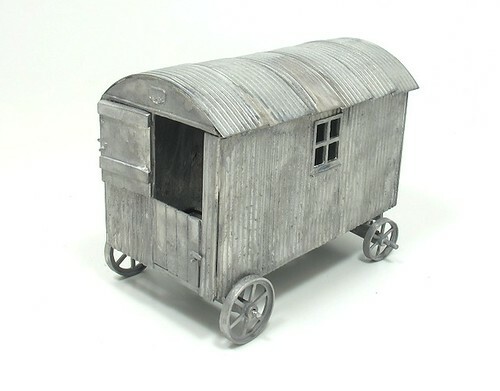 While the Adams Radial awaits a little finishing and then paint, I'm reminded that I promised to build a Duncan Models shepherds 7mm scale hut for the NRM. A start has been made for a little video work but it was no way finished. A couple of hours low-temperature soldering later and things look a lot more complete. The kit isn't too tough. The sides are big slaps of whitemetal and once you work out which way the undercarriage goes (Hint: arms for pulling at the opposite end to the door) it tacks in to place. The roof is made up of metal sheets (Ambis Engineering?) that have to be bent and then trimmed to length. These were soldered with C&L 100 degree solder. Not sure what they are made of so I was pleasantly surprised when the solder took to them. I ran a bead along the outside of the sides under the eaves as the framing for the undercarriage gets in the way inside. Sheets are overlapped but as you only just get enough material, it would be better to but joint them as I only just reached the ends of the body. Cleaning was with a spray of Cillit Bang rather than Shiny Sinks. It's easier to get into the inside corners with this and in theory, the degreasing performance should be excellent. To paraphrase Barry Scott - "Bang! and the flux residue is gone!" Duncan asks: I intend to build a wharf (Medway based) with either a small part of a copper cable works OO9 served and a cement/lime dock OO served. I would like come guidance on building/kit building/kit bashing a suitable coaster. 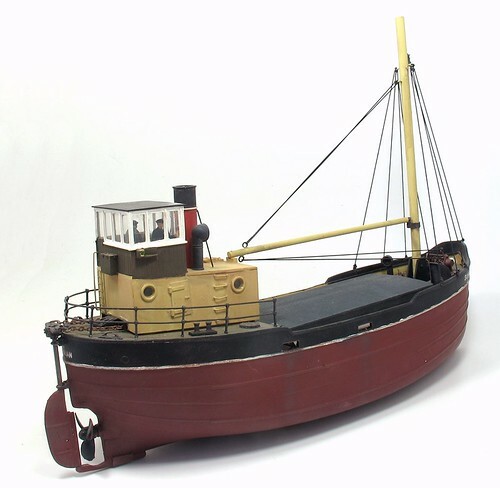 I do not want to lay out a king's ransom for the tiddley Langley models puffer! 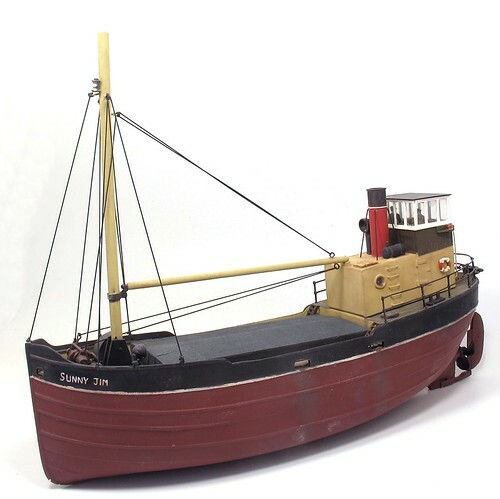 Both do Puffers cheaper than Langley BUT you have to do a lot more modelling. 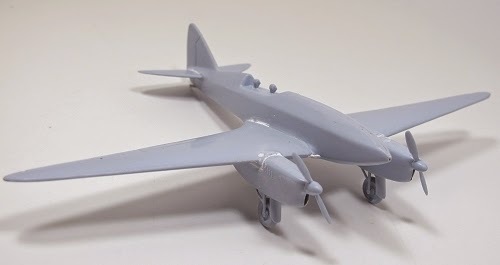 The Langley kit falls together and is highly detailed which is why it costs more. After this, you are looking at foreign kits which aren't a bad option as boats vary so much in size. You can carve hulls from balsa wood or build up former and plank the outside. Either is a lot of work but worth it for the effect. I'd suggest buying a couple of copies of Model Boats magazine if you fancy this as you'll soon get the idea. I'd also recommend a copy of this: http://philsworkbench.blogspot.co.uk/2012/10/book-review-tiffys-workshop-marine.html as it's a fantastic one-stop guide. The Deans Puffer is fitted with radio control for sailing on calm water. Reading popular web forums after the Warley weekend, it seems that there are some British Standard moans. Rather than enter into arguments, I thought I'd look at some of these and give my opinion. It is after all, my blog and unconnected with anywhere I might work. If you think I'm wrong, put it in the comments. Really? It's not as big as the classic motor show the previous weekend and very little different in size from the IPMS show at Telford a couple of weeks earlier. I visited both as a punter and after 6 hours knew I hadn't seen absolutely everything. To me this didn't matter. I'd had a nice day out and looked at an awful lot that did appeal. Rather than make the show smaller, the trick is just to look at the stuff that interests you. We all enjoy some aspects of the hobby more than others and with so much on offer, it's perfectly possible to wallow in those and ignore the rest. Think of it like a Chinese buffet meal. One where you can enjoy just the dishes that you like and don't feel the need to eat the ones you don't. More to the point, how big is too big? I've seen visitors exit a show after an hour. For them, anything more than the tiny amount they have seen is too much. What's the level? A hour? 2 hours? half a day? Now if you want a really big show, visit one of the major European events like Eurospoor. If you think the NEC is too big, that's going to make your head explode. Why is the lighting a horrible yellow colour? Because this is an exhibition hall and if you visit a "normal" show, all the stands bring their own lighting. The stuff in the ceiling is just to stop you tripping over between stands. Admittedly it is a horrible sodium yellow colour. Modern halls have white lights which might still be on the dim side, but at least there isn't the horrible colour cast when taking photos. Demands that the NEC change them aren't likely to be met with enthusiasm as it's probably only the tiny (in NEC terms) toy train show that is bothered. When we take multiple halls for several days like one of the big shows they might be a bit more interested in spending a significant amount of money. This does expose one of the problems with the hobby - we are amateurs and it shows. Layouts generally turn up with their own lighting. Illumination in venues varies enormously and so it's pretty much essential to bring your own light if your efforts are to be presented to best effect. Trade stand though, very few have any form of lights even though they know just how bad it will be. This isn't the case in other hobbies. That classic car show was much better lit everywhere but the autojumble. Head abroad and the standard of trade stands is much more slick and professional with display cases and shell schemes being common. In the UK we tend toward the "chuck the stock on a paste table" approach. Maybe this is cheaper, or maybe it just looks like it. OK, so presentation costs money but when you are competing with so many other stands, a few lights that make it easier for the customers to see the stock has got to be worth considering hasn't it? Yes, lots of people want to visit. 17,000 of them over the weekend apparently. This is A Good Thing. Hiring a proper exhibition hall is horrifically expensive. That means you need decent crowds to make the show pay. Large numbers mean the show is popular so someone is doing the right thing. Oddly, people also complain when a show seems empty. Everyone likes to be at a successful event so if you are generous with the aisles and it's easy to get around, the moan but if you tighten them up and it's a bit harder, they moan. 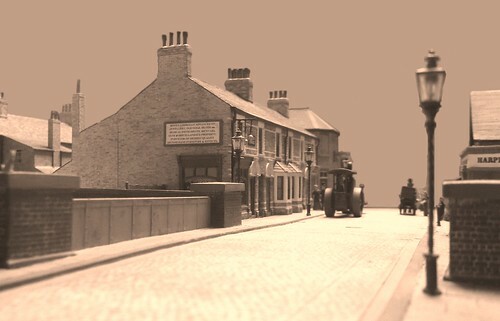 The other problem is that modellers all want to visit on Saturday for fear of missing out on a bargain. Shows attendance over a weekend is always 60:40 and yet it's almost impossible to persuade anyone to do the second day. Sunday this year was quite pleasant to walk around, especially after an hour when the crowds had distributed themselves evenly through the hall. One problem that can't be fixed is crowds around popular exhibits. If everyone wants to see a layout, you'll have to wait. No matter how big the venue, or how much space allowed around it, the layout doesn't get any bigger. Tickets on the door were £14. Advance ordering save £1.50. For that you had a full days entertainment in a show that was big enough for there to be something for everyone. If you spent the money on beer it would last less than 2 hours. Coffee in a chain shop wouldn't last any longer. Spend it on football and they wouldn't let you in past half time. Maybe the problem is that it costs a lot compared to other model railway shows. If you never look outside the extremely price sensitive hobby then it's difficult to judge. IPMS Telford cost a tenner, the GOG event at the same venue costs £12. The classic motor show was £21 and that's not uncommon for car based events. Brick 2014 in London will cost the Lego fans £30 to enter. £14 isn't an insignificant amount of money but on it's own it's not the end of the world for a big event once a year. However, there is the cost of travel to add to it and if you drive there's a tenner to spend finding a home for your car on site. Assuming that like most visitors, you came on your own, that's nearly doubled the cost, not good. Of course there are ways around this. My travel by train on Saturday worked out at less than the price of the parking. There are several stations on the same line that offer cheaper parking even when you add in the cost of a couple of stops worth of travel. For longer trips, it sounds crazy but a cheap flight might be better value. I can't claim to be an expert but the airport is right next door and plenty of European visitors find it cheap enough to make the trip. The food is horrible and too expensive. That's exhibition catering for you. Posh burger vans that have to extract every pound out of the people trapped in the hall. It's the same at every exhibition hall in the country. With thousands of people to cater for, you can't suggest that the club members wives whip up a few cakes to sell. Having said that, the Subway sandwiches were less than a quid more than the high street price and perfectly nice, or at least I though so. The cheapest alternative is to bring a packed lunch. Plenty of seating was available for those who wanted it. Yes it got busy in the middle of the day but that's when most people wish to use it. Next up, there are eateries within the NEC but not in the hall and they aren't quite as expensive. You'll probably get a sit down too and even beer in the Weatherspoons. Finally, the airport branch of Frankie & Bennies fed me on Saturday evening with a delicious spaghetti bolognaise for under a tenner. It arrived so fast, they have to cater for people heading to aeroplanes, that I would have been able to leave the show, eat and return in under an hour. OK, it's a 15 minute trek each way but you do get a ride on the cable railway. NEC security are notorious but then if you spend all day trying to direct people around, especially when every second one thinks they know better than you AND you're out in the rain then you'll be a bit grumpy too. This year everything was sweetness and light in my experience and that of many other people so I can't complain. As for the Warley stewards, well, most of the time they are brilliant. I had a bit of an issue with one individual this year but apparently he's officious with everyone. The problem is that these guys are all volunteers so there is an element of you take who you've got rather than necessarily who you might want. They are there hours before even the exhibitors turn up and don't get to leave until after we've escaped. That's a looooong day for no money and everyone, even you, have an off day sometimes. If you think you can do better, I know the club are always looking for volunteers. A general show has to be all things to all people. If your interests are very specific, you will probably be a lot happier at a very specific show. Where are all the small traders? At specialist shows. Look at the Warley crowds. They represent the current state of a market that wants ready to run models. They might like to look at some of the oddball kits, but only in passing. Traders need to make money and that means selling products. They need to shift enough over a weekend to cover travel, accommodation and stand rent. For most that's very difficult. At a specialist event where the ratio of serious punters to general visitors is high, they might just do it. If not at least some of the loss can be put down to marketing. Having said that, what was missing? 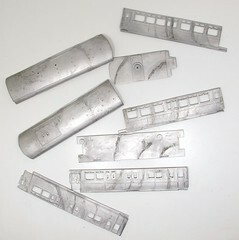 You could buy etched loco kits, scenic materials, track and pretty much everything else you might need. If your list includes exotic very finescale products then a Scaleforum is probably more use to you, but then it wouldn't interest the general visitor. Many years ago, I was chatting to the Warley treasurer and he explained a problem I hadn't thought about. The people with money are the box-shifters. Set the stand rate too low and they will buy up miles of hall. Set it high enough to prevent this and you'll price out the little guys. There have been a few changes - the MRJ small suppliers area is considerably cheaper to exhibit in than the main hall, it's still more expensive than a standard exhibition but at least it's something. As you might guess, I'm a big fan of the show. While not perfect, it's the sort of centrepiece the hobby needs. I also appreciate that you can't please all the people all of the time. I don't think I can do better but if you do, I'm sure the organisers would welcome you volunteering to hep out. For the last few years, the national show at the NEC has involved me sitting behind a demonstration table chatting to people. This time it was my first stint standing behind a table on the British Railway Modelling stand, chatting to people. In front of me I had Owen's Bridge, my recent WW1 project now half way through its serialisation in print. There was also the layout on a tray and beer festival diorama. Sunday saw some table space open up as Andy York was sat at home processing photos, so I added my campsite and painted people scenes. What this meant was I spent virtually all day chatting and hardly any wandering around looking at things. Trips to the Subway stand at the back of the hall via a circuitous route were my best hope of spotting anything while the event was open. That's not a complaint, I love chatting to people more than anything else, but if anyone is expecting a full show rundown, you're going to be disappointed. 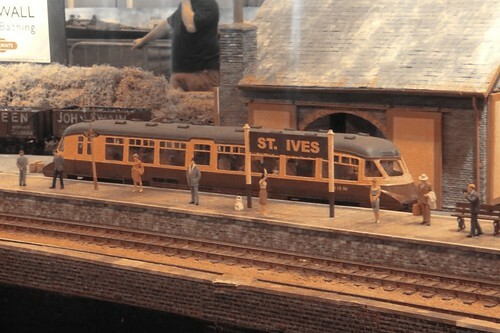 What I did spot was St Ives, a fantastic gauge 3 layout with scenery. I've not seen this before and probably won't again. The model is due for only one more trip out and it takes a show held in a hall the size of the NEC to accommodate it. Well, that and the 5 inch gauge shunting plank layout behind it - both were very popular with the crowds. Apart from this, I nipped out to look at some new products. Peco's laser-cut station building looks very nice and of course I was stupidly excited about Accucraft's "Sealion". The Dapol O gauge Terrier looked very pretty too in it's yellow livery although I'm told that's it's a dreadful model that brings shame upon the hobby or summat. I liked it though so perhaps I'm dreadful too. No, the weekend belongs to chatting. Lots of people wanted to know how to model a canal. Quite a few were very interested in electrostatic grass and my techniques for enhancing it. We also discussed how green a WW1 Simplex should be although I'm still not convinced on this point. At the end of Sunday, I wheeled out my stand on a trolley and was on my way off the site by 6pm. Not bad at all. What makes a good Radial? Subtitle: Why I can't be bothered to fit lamp irons to this loco. With the Radial now in it's first coat of primer, I've been pondering how I will finish off the model. A couple of months ago, I ruminated on exactly how good a model needs to be if you are planning to use it on a layout. My feeling was that once you look something as part of a complete scene, it's more important that everything is to a similar standard rather then be perfect to the tiniest detail. One detail I have always had a bit of a blind spot over is lamp irons. Yes, I know they should be on the ends of the model but if they aren't, I don't miss them. Sacrilege I know, but that's me. The Radial should be festooned with the things including a pair of entertainingly shaped ones sticking out the sides of the smokebox. I looked at these and decided I couldn't be bothered. Maybe the straight ones could be made out of staple but those "wings", that's a job for brass strip and doing things properly. Mess up and it would be better to leave them off. An added benefit is that the pretty front end of the model is, to my eye, enhanced by the lack of sticky up bits. This isn't madness. You can report me to the finescale police all you want, but I think it's the right decision. Too much detail would be inconsistent within the model. Look closely and you'll notice a lack of brake gear. Well, the frames are made from armour plate cut out of a decommissioned battleship. Drilling through this for hanger wires would technically be possible but hard work. I'd have to take the wheels off and I'm not sure they would go back on the axles properly. Some brake gear would also need scratchbuilding and I don't have a plan to hand. Even if I did this, the cab is full of mahosive open frame motor. One of those bombproof jobbies from the 1960s that runs sweetly but at a cost of being the size of a small car. Really I ought to replace it with a more modern smaller unit and then build a cab interior. But then the fit of the body around the splashers isn't perfect. There's some work to do shown in the photo along the footplate - I said this was the first shot of primer. No, basically this kit is what it is. Attractive but on the basic side. 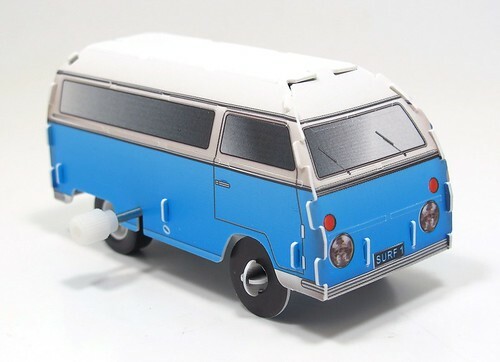 If I want a hi-fi model I need to build an etched kit, or just wait for a RTR model to appear. I've seen the first shots from Hornby and they are better than my version if you want to look closely. So, I'll build the kit and enjoy it. Maybe my model won't win any prizes but I think it's going to capture the character of the prototype and look very nice indeed. At the end of the day that's what matters.